The Anachronism That Was The Music Machine. The grainy photo above depicts a never-before seen example of the gothic response to American Bandstand. Just kidding! The picture is of the Music Machine and I think it is time that we explore this band’s story in today’s version of Obscure Classic Rock. The Music Machine story begins with a high-school age Sean Bonniwell, who, after hearing the song “Only You” by the Platters, decided that he wanted to form a clean-cut vocal band. The result of this aspiration was the pop/folk quartet the Wayfarers who released three albums under the RCA label. It is important to understand that despite never reaching tremendous success, Bonniwell was a very talented musician who released several albums. The folk scene eventually started dying down after the British invasion and the introduction of harder, bluesier rock, with electrical instruments, organs and keyboards; an overall heavier sound. Bonniwell decided that he wanted to take advantage of this scene in 1965. He formed the Ragamuffins and the band immediately fit neatly into the edgy, fuzzy garage rock sound that was spreading throughout the nation. 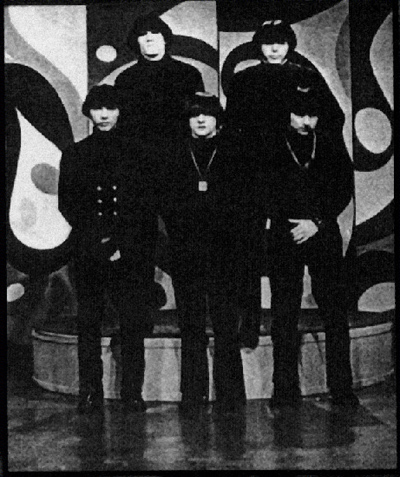 The Ragamuffins, who would become the Music Machine in 1966, was based in Los Angeles. Perhaps the most distinctive part of the group was their look. We will get to their sound in a second. As you can see from the picture above, each member wore all-black clothing, dyed black moptops, and (not visible) a single black glove (Michael Jackson’s staple – pre-Michael Jackson). Their anachronistic look reminds me of the all-black gothic scene that was a fad (is it still?) when I was in High School (like 5 years ago). It can also be viewed as punk. Hmm. Punk. Lucky that their music cooperates with the punk sentiment. Let’s talk about the song “Talk Talk.” It is an awesome piece. Here is why the less than 2-minute song is worth listening to over and over and over. The riff is classic garage rock – fuzzy guitar layered over an organ. Bonniwell’s deep voice suits the song perfectly. I absolutely love the Hendrix-like grunts (pre-Hendrix) and, what I can only describe as the Talk Talk repetitive beat (because of how the song ends). I am keen on saying a lot of garage rock released during this time period exemplifies pre-punk (or protopunk). I throw around this term a little too much, but, with “Talk Talk” I do believe that there is clear inspiration evident. The short, fast, heavy beat, repeating guitar riff, bare instrumentation. It all fits. And I love it. The riff around .55 was interesting. I want to say White Stripes with a keyboard, but not quite. Will have to look around for more. I can definitely see that. This is their most punky/rocky hit in my opinion and definitely their best track. Do check out the first and only album. There are a few worthwhile originals and some neat covers. Thanks for reading like always, John! No sweat Matthew. I like your taste, it is just slightly off from mine and that is great as it leads me down some different paths. Music is great for that. Absolutely. Getting introduced to a new song/artist that is enjoyable is always exciting. It provides an opportunity to explore a new territory and variations of style. It can even be considered somewhat similar to traveling to different places and experiencing new cultures (genres, lol) and I have continually enjoyed your posts on travel and music because of that. Thanks again and happy holidays.